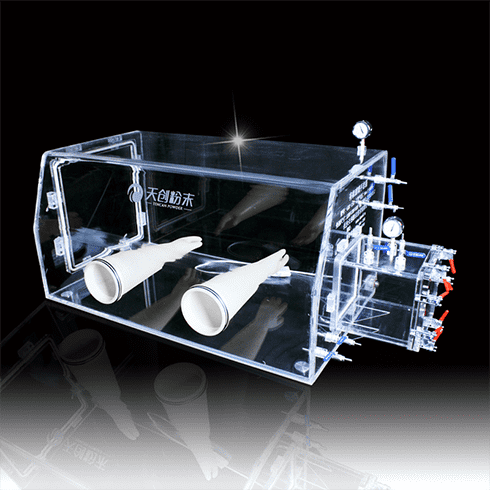 Acrylic glove box is a kind of organic glove box and is also called Inert gas operation box. In course of scientific experimenting, some substances are easily to be oxidized and humidified. That makes reaction of test materials and sample predisposing very difficult and influences experimental process and test result. Acrylic glove box helps you to solve all those problems effectively. Tested samples can be input and output safely by the device and you may operate freely inside the glove box, making reaction and testing under anhydrous and anaerobic conditions, it ensures normal operating of scientific experiments. 4. It has good sealing performance, and shields and absorbs Alpha (α) rays and low energy beta (β) rays emitted by radioactive materials to protect human body tissue exposed to radiation damage. it benefits people to do some closed isolation operations inside the box such as experimental work of scientific research units for low energy radioactive substances, microbial inoculation of sterile operation and chemical qualitative and quantitative analysis. 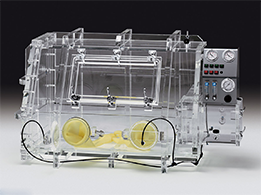 Acrylic glove box is widely used in biochemistry, metallurgy, electron, chemical, geology, minerals, medicine, electronic materials, magnetic materials, battery equipment, biological cultivation, food vacuum packaging, battery materials, and so on. A Model A is special for radiation protection, isolation operation or dust control operation. 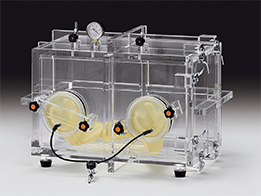 It can not be vacuumized, and the fully transparent box is convenient for observation. B Model B can be vacuumized slightly to 0 MPa, and then you can replace with inert gas to maintain inert gas environment. This model is suitable for the experimental operation of materials which have low sensitivity to water and oxygen content. Transition box is optional. C Model C can be vacuumized inside the box, transition box can be vacuumized to the max vacuum degree ( -0.1MPa), and then you can replace air with inert gas to get pure inert gas environment for operation. 1 GBT-10A 700*450*500mm PMMA Material 10mm 240*240*240mm 245*325mm Isolated from dust,can not be vacuumized. 2 GBT-15A 700*450*500mm PMMA Material 15mm 240*240*240mm 245*325mm Isolated from dust, slight vacuumized. 4 GBT-10B 1000*500*500mm PMMA Material 10mm 240*240*240mm 260*340mm Isolated from dust,can not be vacuumized. 5 GBT-15B 1000*500*500mm PMMA Material 15mm 240*240*240mm 260*340mm Isolated from dust, slight vacuumized. 7 GBT-10C 1200*600*600mm PMMA Material 10mm 240*240*240mm 358*422mm Isolated from dust,can not be vacuumized. 8 GBT-15C 1200*600*600mm PMMA Material 15mm 240*240*240mm 358*422mm Isolated from dust, slight vacuumized. 10 GBT-10D 1200*800*700mm PMMA Material 10mm 240*240*240mm 528*488mm Isolated from dust,can not be vacuumized. 11 GBT-15D 1200*800*700mm PMMA Material 15mm 240*240*240mm 528*488mm Isolated from dust, slight vacuumized.